Okay, just when I'm starting to feel like I've got the general rules to this game and I'm down to details and strategies ... What do the two big Terrors belows the card text mean? Yikes. I can see why opponents might be tempted to pay the penalty to keep him off the table. He's got good and bad points. Tons of terror, but a fair number of things are immune to that. Zero skill is a huge drawback, meaning he can't make any story progress on his own. He's also vulnerable to anything that targets low skill characters or "lowest skill" characters. Not a bad card, but I don't find him overpowered. No, not overpowered, but pretty killer for the struggle he specializes in. 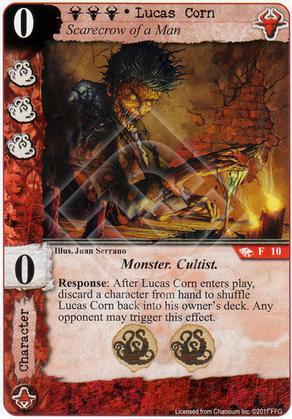 Lucas Corn is at his best when considered within the context of the Revelations set. The Three Bells was part of Revelations too, and the synergy between Lucas and the Bells is pretty obvious. When I slot Lucas into a deck, it's because I'm trying to seed the opponent's discard pile with a big character to steal. If Lucas actually remains on the table, I'm typically surprised and a little disappointed.